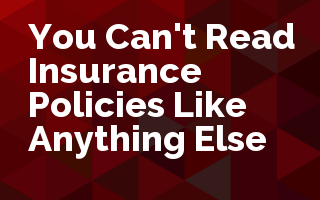 Insurance policies are hard to read. We all know it and we all act like they aren't, especially when a customer asks us a "simple" question. You can't just grab a policy and start reading page one and read all the way through. It jumps around and you have to know where to jump with it. Join us as Patrick brings us his top guidelines for how to read an insurance policy and more importantly, the simplest ways to explain the policy to your customers. 100 years ago, a fire policy covering someone’s home was a one-page document, covering the front and back of that page. Today, a homeowners’ policy can be 30-40 pages (or more). To make it more interesting, most states have passed laws requiring that insurance policies meet a readability standard. Some state that they can’t use complex sentence structure. Others state that they need to meet a certain readability score. Yet, everyone still has trouble reading insurance policies. This session will walk us through a few key principles for how to read an insurance policy to make sure that we understand it and can explain it to our customers. Discuss the primary guidelines for reading an insurance policy. Interpret the words in an insurance policy. Demonstrate the importance of conjunctions in lists in an insurance policy.